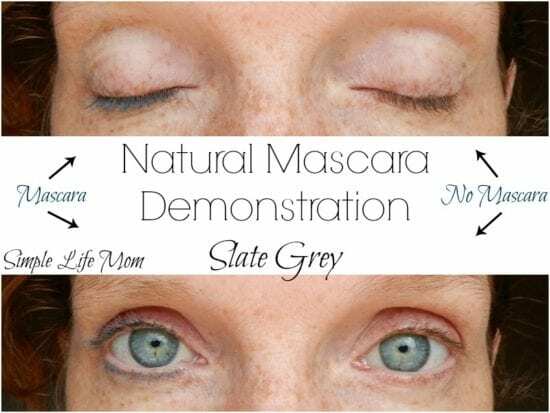 I have multiple natural mascara recipes here on the Simple Life Mom website. I have simple recipes using charcoal and coconut oil, or even egg yolk. I also have another recipe that I love that is a little more than egg yolk and charcoal, but still simple enough to make at home. So, why a new natural mascara recipe? The answer is simple. I’m always looking for something better. I really enjoy using the “Mascara Recipe that Really Works” during cooler months and the winter, but the problem is that that recipe is oil based. It does not dry. If you sneeze too hard, get sweaty, or have allergies, then you’ll either look like a raccoon or wipe it off in short order. I have adjusted and can use my other home recipes quite easily, but like I said, I’m always looking to improve. 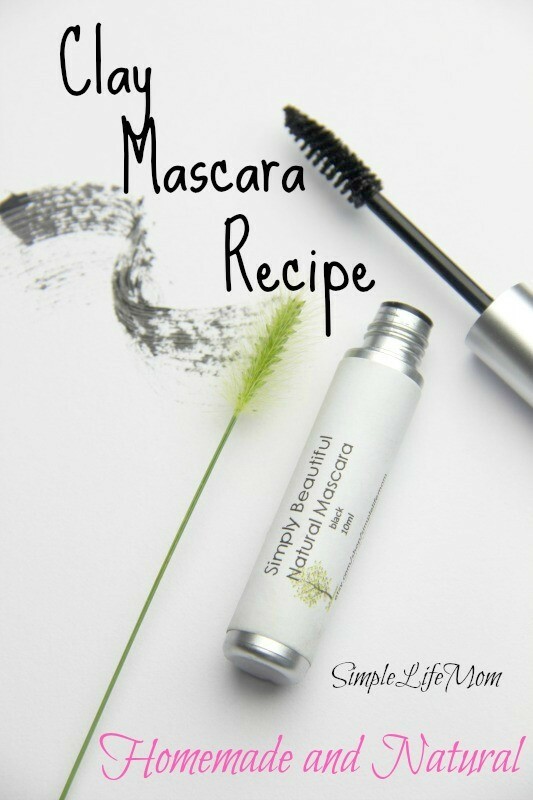 Some of you already know that this is the mascara recipe I had in My Shop for a few weeks. I LOVE it!! Why is it no longer in my shop? It has a short shelf life. Once the hot summer hit, it became clear that mine at home wasn’t lasting as long as it was during the winter. You really need to make a small amount to last you for 1-2 weeks, and then throw that away and make a new batch. Since it is super cheap in the long run and only takes a minute or two to make, that shouldn’t be a problem for those of you making this at home. There’s no way I could sell mascara to you that is only going to last 1-2 weeks though (obviously a lot longer in the winter, but still!). Here was my train of thought: I was using my Anti-Aging Clay Mask and was laughing at my clay hardened face when I thought, this really dries well. Mascara just doesn’t dry like this. Oooh, Why don’t I make mascara that dries like this face mask??? After all, many clays are super healthy for the skin and I really enjoy using bentonite clay. Plus, it dries within 2 minutes. I can apply once in the morning and have to literally wash it off at the end of the day, as opposed to oil based natural mascaras that seem to disappear on me as the day goes along and I have to reapply. It is WAY more healthy than any toxic chemical brew you may be using from the store. mascara and can clean it out and make more quickly and easily. Combine all ingredients in a small container and mix well with a wooden spoon or wooden stick (skewers work wonderfully). As with all natural body recipes, try not to touch it with your hands in order to minimize the introduction of bacteria. Dip a sterilized mascara brush into the clay mixture, use the side of the container to remove any excess, and apply. Keep tightly sealed in a cool location. Throw away in a week or 2 and make a fresh batch. Have fun being creative and bringing health to you and your friends! Are you using fresh aloe Vera gel from a plant? Can’t wait to try this, thesis for sharing! No, I buy mine. All natural aloe is very watery without any thickeners to make it a gel. I’ve never heard of home made natural mascara. Thanks for sharing this! I never knew I could make my own mascara. Thanks for teaching me about it. This is totally new to me! What a fantastic idea! I had no idea that one could make mascara. Very cool!! So smart to use the clay. This would be a fun project to try with my daughter. Thanks for the ingredient lists! Wow! I didn’t realize this is something I could make at home, very cool!!! Making your own mascara sounds so cool! So need this on my to -do list and quickly. I’m making over my medicine cabinet. What’s up with the constant replacements, is it necessary or just a precaution? I don’t wear makeup often so I’m unable to make it on a weekly nor do I have time to do it immediately before use. If you don’t use it often, then you can keep it in the refrigerator and make sure that you don’t touch it with your fingers and it will last a lot longer. It is necessary. Since it is water based, it will mold after a few weeks. This is going straight to the top of my to-do list also! It does dry hard, but that just may work. Now I’m going to have to try it! ? Its not a flaky finish, but I’m guessing it would depend on how much you use. A minimal amount at roots may still lay nicely without being stiff. Technically, there is no water in this. There IS the aloe vera juice; wondering if you added a few drops of grapefruit seed oil or vitamin E if that would prevent or slow the mold issue? Thank you for this recipe. I’ll have to try it soon. Aloe contains a high amount of water. Vitamin E can help, but to be safe you need to just remake once per week. Where do you buy your mascara tube? I’m having a difficult time finding a non-plastic one. Thanks! All I’ve ever found was platic. You can use a small tub instead and dip the brush in and wipe it on the side.